Space is limited. Tickets may be purchased online, at the Wildling Art Museum, or by calling 805-686-8315. Walk-ins on the day of the screening are welcome, but are not guaranteed a seat. 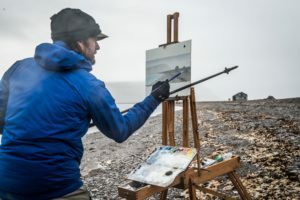 On March 2 the NatureTrack Film Festival will partner with the Wildling Art Museum to present a special pre-screening of an "official selection" for the 2019 NTFF Festival, Into the Arctic: Awakening by director Cory Trépanier, a landscape painter, filmmaker, and explorer based in Ontario, Canada. Cory’s fine art career spans two decades and has always been intertwined with his passion for the outdoors. The NatureTrack Film Festival is excited to have Cory as its Saturday Spotlight Dinner speaker during the March 22-24 event. This partnership with the Wildling Art Museum is the perfect opportunity to introduce this extraordinary artist to the Valley, ahead of his visit during NTFF. Cory Trépanier's film, Into the Arctic: Awakening, focuses on the untamed beauty and lure of the North, which has drawn him to paint the Canadian Arctic for over a decade. In the film, Cory is preparing for a touring exhibition to premiere in Washington, D.C. by heading back on his last expedition to complete his vision. It is the fifth in a series of painting expeditions. But much has changed since he first went North. Shrinking sea ice is opening the door to a world hungry for its resources, and remoteness can no longer protect this land or its people from the coming impacts. For nine weeks and 25,000 kilometers, Cory immerses himself into the Arctic. He explores with Inuit elders, paddles the most northerly canoe route in North America, and walks in the footsteps of early explorers John Rae and John Franklin. Voyaging through the Northwest Passage, Cory deeply connects with a changing land, eager to bring it to the eyes of those who may never see it. With the future of the North at a crossroads, can a simple stick and some bristles paint the Arctic into the hearts and minds of others, so far away? In 2001 Trépanier began filming his painting expeditions, leading to four televised documentaries: A Painter’s Odyssey, Into the Arctic: An Artist's Journey to the North, Into the Arctic II (nominated for a Canadian Screen Award), and TrueWild: Kluane. His fifth film, Into the Arctic: Awakening, had its first pre-release screening in Monaco before Prince Albert II. His films are broadcast in Canada and internationally. In January of 2017 Trépanier’s INTO THE ARCTIC exhibition — an unprecedented collection of 60 canvases and his Into the Arctic films — began touring for four years, with 11 museums on the itinerary to date. Created in over a decade of painting and exploring the Canadian North, it premiered at the Embassy of Canada in Washington, D.C. Highlighting the collection is the 15-foot-wide Great Glacier, quite possibly the largest Arctic landscape painting in Canada’s history. Trépanier has been featured in media around the globe, and his documentaries broadcast internationally, sharing his passion for the wild places that he explores and paints. Through his unique vision, expressed through art, films, public speaking, and online media, Cory inspires others with our planet’s natural wonders. Canadian Geographic named Trépanier one of Canada’s Top 100 Living Explorers. He is a fellow of the Royal Canadian Geographical Society and a member of The Explorers Club, receiving the Canadian Chapter’s highest award, the Stefansson Medal. He is National Champion of the Great Trail. The NatureTrack Film Festival (NTFF), the only nature-focused film festival between LA and San Francisco, kicks off on Friday, March 22 with an opening reception prior to screenings that evening. A full slate of films will be offered on Saturday, and the festival will conclude on Sunday, with a half-day of programming and a closing reception. Films will screen at three venues in Los Olivos: the Santa Ynez Valley Grange, the Gates Foss Community Center at Los Olivos School, and St. Mark’s-in-the-Valley Church. Filmmaker panels and Q&As are all in the mix for the second NatureTrack Film Festival, along with special bonus and repeat screenings of select films. NatureTrack will also offer docent-led hikes for those wishing to take advantage of the abundant natural beauty of the Santa Ynez Valley for a more immersive outdoor experience. Passes to the 2019 NatureTrack Film Festival may be purchased at www.naturetrackfilmfestival.org. The Wildling’s mission is to inspire our community and visitors to enjoy, value, and conserve wildlife and natural areas through art. We provide artistic, educational, and field experiences of nature for that purpose. Our vision is to be recognized as an exceptional and innovative leader in inspiring our communities and visitors to value wilderness and other natural areas through the lenses of a diversity of artists. The museum strives to collaborate with others for the betterment of our communities. ← Thank you to our new Partners!